Pep Guardiola does not feel under pressure to win the Champions League because the success of recent seasons is "not normal" for Manchester City. Expectations are high that Guardiola, who twice guided Barcelona to Europe's top prize, will lead the Premier League champions into the final four for the first time since taking charge in 2016. But the City boss is at pains not to place overdue emphasis on the need to turn domestic dominance into continental glory. "We won a lot in the past and that's why people believe that is normal, but that is not normal," Guardiola said. "My standards are not thinking 'we are Manchester City, we have to win everything. We have to win the final and if not it will be a disaster'. "It will be a disaster when you don't do what you have to do, [which is to] put in absolutely everything to try it. "When you are in the position that we are right now, I don't have not many complaints. I'm pretty sure our fans know it. If we progress to the semi-finals we will face either @juventusfc or @AFCAjax! "When I spoke with my chairman, CEO, sporting director, the people here working know and they give credit for what we have done in the last two seasons. At the end, that is the most important thing. "After that, everyone can judge if it's a disaster. If we do not win the Champions League, our work for three seasons, every three days, is a failure or a disaster. "I completely do not agree but what can I say? Accept it and move on." City, who visit Swansea City in the FA Cup quarter-finals on Saturday, remain in the hunt to win four major trophies this season and those hopes will be boosted when star midfielder Kevin De Bruyne returns from a hamstring injury after the international break. 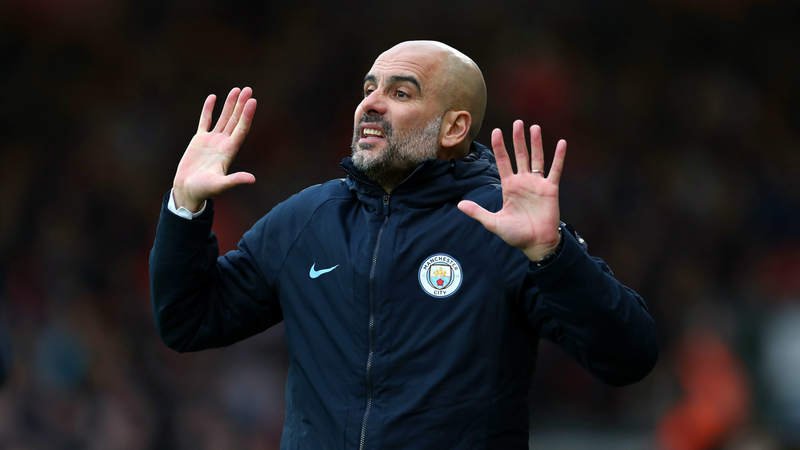 Persistent fitness problems have curbed his influence this term but Guardiola is confident the Belgium international will soon recapture his best. "He feels much, much better but not 100 per cent," the Catalan said. "The doctor told me that and Kevin told me that he'll be ready after the international break, so that is what I want. "Kevin, we know, he needs his best shape but he always creates something for the team, with vision and what he has to do. The important thing is he'll be back, and he'll be back good."